As 2019 begins, millions of Americans set goals for themselves on things they would like to do or improve this year. For parents and caregivers of toddlers and preschoolers, this New Year’s tradition offers a wonderful opportunity to expand children’s learning through the introduction of everyday chores. For young children, homes that have a stable daily routine helps reduce anxiety in their lives. According to the American Academy of Pediatrics, children need to have some obligations and duties within the family so that they can learn to accept responsibility. 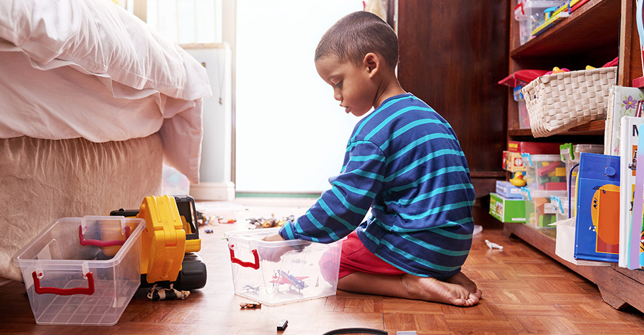 And the habit of pitching in around the house can begin as early as age 2 with something as simple as asking the child to pick up his toys after playtime. But that doesn’t mean that a young child should be assigned too many responsibilities. Always talk to your child about the chore and why you are asking her to do this. Be specific with your instructions. Rather than saying, “clean your room,” say, “pick up your clothes on the floor and put them in the laundry hamper.” Or “put all your books back on the book shelf.” Modeling the behavior will help them understand what you expect. Parents and caregivers of young children can support the development of social-emotional skills, also known as executive function skills that are reinforced through chores. Executive function skills include self-control, using memory to make connections between ideas and the ability to think creatively. These and other social and behavioral skills — such as motivation, self-discipline, focus and self-esteem — begin to take root from birth to age 5. Put the toys in a bin. Help set the table. They can put down a napkin or put the fork on top of the napkin. By turning everyday moments into learning moments, we can build skills such as responsibility in our young kids that will help them succeed in kindergarten and beyond.